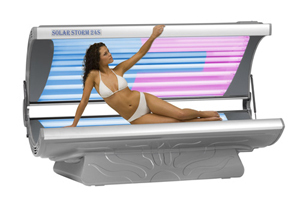 Tanning Goddesses is an Authorized Dealer of three quality brands of tanning beds and tanning booths. Tanning Goddesses sells NEW ESB, Solar Storm, and Solar Wave tanning beds, tanning booths, and space saving stand-up tanning units. We offer a full line of home tanning equipment and also commercial tanning equipment at great prices. At Tanning Goddesses we know your tan is important to you. Tanning Goddesses can offer the expert help that others cannot. OEM factory replacement parts and OEM tanning lamps (bulbs) will ensure your tanning bed stays in excellent working order with factory correct parts. Tanning Goddesses also knows it is important have excellent customer service too. Tanning Goddesses sells American made tanning equipment. We use acrylics in all of our tanning beds - not grids like some others do. Tanning Goddesses has indoor tanning accessories like tanning goggles, tanning bed pillows, and tanning bed acrylic safe cleaner.